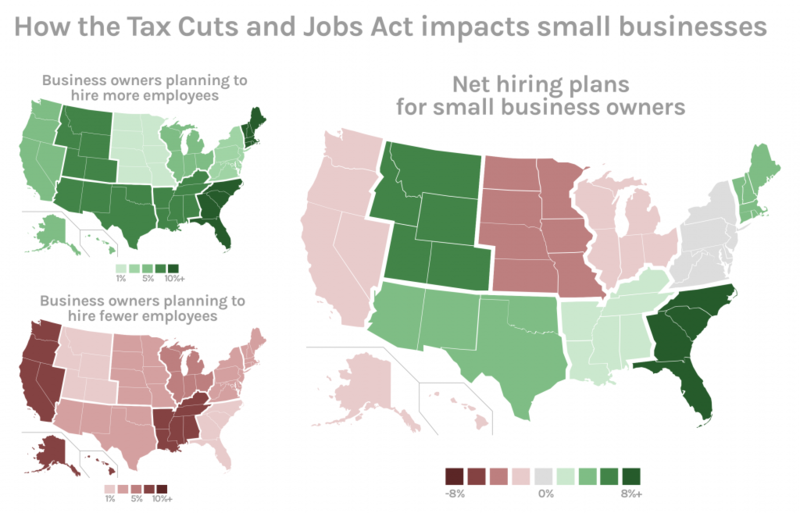 4.8% of owners said that the Tax Cuts and Jobs Act will reduce their hiring plans, 6.9% planned an increase in hiring and 88.3% had no effect on hiring plans based on a recent survey of 663 small business owners. The Tax Cuts and Jobs Act has been in effect for nearly nine months, and its impact on hiring is still unfolding among the nation’s 30.2 million small businesses. The tax cuts were advertised as an avenue to fuel spending on jobs and capital, giving small business owners the funds to hire more. However, in a survey conducted by ZipBooks, 88.3% of small business owners reported no plans to change hiring after the Tax Cuts and Jobs Act. In fact, nearly 5% actually planned to hire fewer employees. This may explain recent reports that small business hiring has fallen in May and June. The results provide key insight into the trends we’re currently seeing among small businesses. When we dove into the data, we observed the regional differences shown in the graph above. Republican regions showed slightly more support for the Act, but stagnant hiring plans appear bipartisan. Small businesses were expected to benefit financially from the Act—hence the projected increase in hiring plans. The tax changes offered small businesses the expansion of the 179 filing (facilitating business-expensed equipment), the pass-through deduction, and lower individual tax rates. But the Act was controversial before it passed and many individuals, especially members of the Democratic party, questioned its potential perks for small enterprises. So is it about politics? 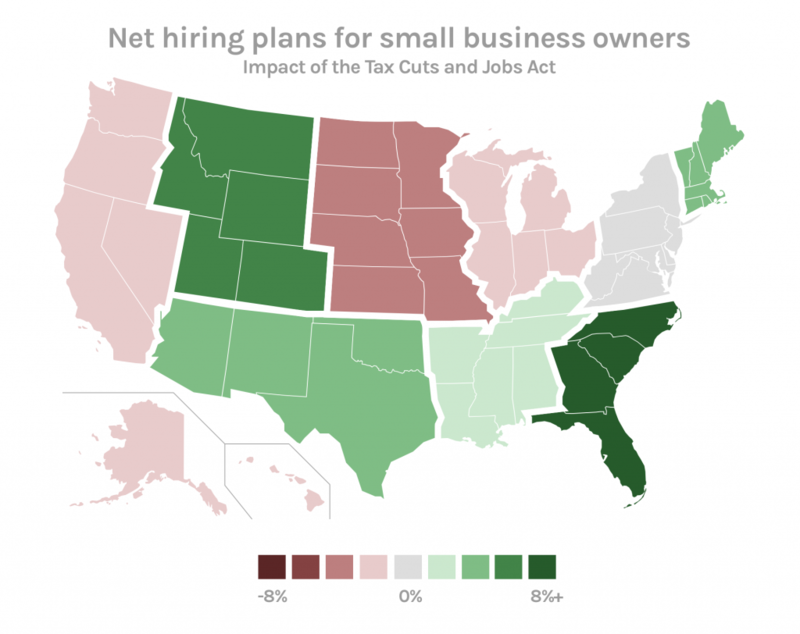 Results appear to suggest that small business plans for hiring may be more regional than political. The Midwestern states, seven of which voted for the Republican nominee in the last presidential election, had a negative 3.3% net hiring rate. In New England, a strong democratic region, the survey showed a net increase of 6.5% of small business owners who plan to hire more. Their politically inconsistent responses reveal that despite partisan preferences, small business owners a) did not think the tax plan would help them b) had little faith in the Act’s ability to boost funds for hiring or c) did not plan to use the excess funds as President Trump expected them to. Regardless of our reasoning, one result is clear: the Tax Cuts and Jobs Act is not motivating small business owners to change their hiring plans. At least, not yet. Zipbooks is invested in the future of small businesses, so we’re eager to see if their hiring trends change and whether tax changes that claimed to be small business friendly will actually create jobs.